How Close to Darth Vader is Too Close to Darth Vader? 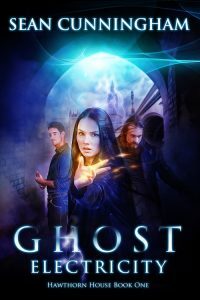 Stephen Erikson, author of enormous Malazan series, wrote a blog post about the uses of psychic distance from a character. Or, to put it another way, he started writing Gardens of the Moon from Andomander Rake’s perspective. Then he restarted it from the perspective of other people around Rake. Result: Anomander Rake comes across as a massive and terrifying badass. Being in Rake’s head would humanise him. You’d see his doubts, his faults, his hesitations, all tamping down the awesomeness of him being an immortal warrior with a sword that devours souls. Darth Vader is like this. I’ve been watching and reading fiction featuring Darth Vader my whole life. My view of him has evolved as the experience of watching him has expanded. Most recently, I experienced Vader through Keiron Gillen’s excellent comics series, Paul Kemp’s novel Lords of the Sith, and Rogue One. Especially that corridor scene at the end of Rogue One. Oh my, yes. At first, Darth Vader is a stark figure in black armour, stalking through the white hallways of the Rebel ship in A New Hope. He is merciless. He is relentless. He is an inhuman monster with a cold and lethal temper. The prequels were not the story we expected. Instead of the tale of a great man falling into darkness, we had a lost and petulant boy. This is, I think, the great failure in the writing of Anakin Skywalker: that he is not great. It is hard to imagine that terrifying black mask ever housing a petulant thought. Imagine instead a rift forming between Obi-Wan and Anakin. As the Republic totters, Obi-Wan holds to the ideals he’s always held. Anakin, with the Chancellor whispering in his ear, comes to believe that far more drastic measures are necessary. This would be a perfect reflection of the greater struggle between democracy and authoritarianism playing out across the Republic. Some final act shatters the bond between the two men, a line Obi-Wan cannot cross, a line Anakin thinks they must cross. And then, lightsabers on Mustafar. 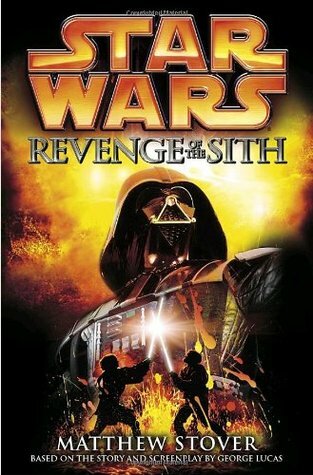 I will say that I loved the novelisation of Revenge of the Sith. It goes some way to making Anakin and Obi-Wan epic heroes. The fall is therefore much harder. That book hooked me from the first page. I devoured it. But it’s still working with the same storyline. Paul Kemp has a tricky job in Lords of the Sith. As I’ve proposed above, Darth Vader is best viewed from a distance. But a novel is all about the interiority of its characters. You have to get in Vader’s head. This, I think, is the clever trick of Lords of the Sith. You’re in Vader’s head plenty of the time, but when you are, he’s mostly thinking about his master. The Emperor is there, with him. The Emperor is the power Vader measures himself against and knows, for now, that he is inferior to. And the Emperor knows this calculation is running through Vader’s mind. He knows his apprentice is looking for the right opportunity to turn on him. When you do view Vader from outside, its from the point-of-view of the unfortunate resistance fighters who find they’re up against him. Then the novel’s interiority works well. Because yes, Vader is terrifying. Watching him cut his way through your team of tough true believers is going to give you the willies. Kemp treads the line well. This is still Vader partially humanised, which I’m not sure is ever to the character’s benefit. But you don’t come away from the end of the novel thinking Darth Vader is anything less than a badass. In Gillen’s comic series, we’re on safer ground. Vader is once again an inhuman mask of blank eyes and an immobile grill instead of a mouth. Gillen gives us flashbacks to moments of Anakin Skywalker, but these are few and far between. Usually you, the reader, are left to remember these past moments yourself. Watching Vader cut off someone’s hand? Ride a lava flow on a plate of steel? Vader makes no comment. But you know he’s been here before. 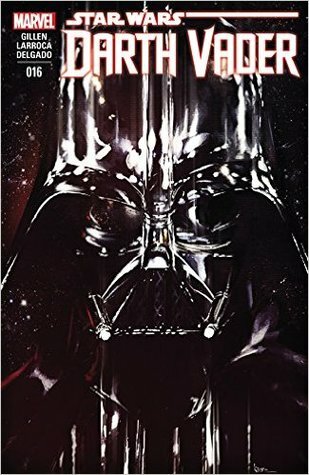 Gillen does an excellent job of distilling Darth Vader down to the core of what makes him tick without sacrificing anything. I loved reading these comics. I go back to them when time allows. And then there’s that corridor scene at the end of Rogue One. This is the monster of my childhood. The inhuman silhouette. The blood-red glow of his lightsaber. The pause to let the Rebel soldiers see, to be afraid. This is the armoured demon I remember watching stride through A New Hope when I was little. Even his earlier moments, in which you see what’s left of him floating in a bacta tank, don’t detract from him. You are reminded that he is monstrous to behold. And then, when he almost chokes Director Krennic to death, you are reminded of his temper. That lethal temper. Rogue One gets Darth Vader right. Anomander Rake is the better for using this technique of distance from a character. I’ve used it as well. 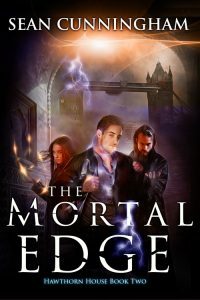 In my second novel, The Mortal Edge, you never step into the point of view of the primary villain, Mitch Longfield. 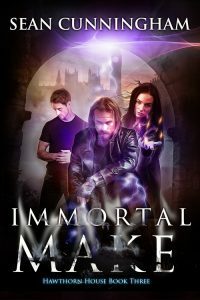 Mitch is a mastermind, moving different factions of London’s shadow world this way and that, manipulating the book’s heroes, always striving towards his own goal. But you watch him do it from the point of view of the vampire Dean Mawson. And Mitch doesn’t tell Dean everything. Novel offer us, the reader, something no other form of media really can: a look inside the heads of its characters. But sometimes, just sometimes, we’re better off looking from nearby. Which leaves you with the question: how to Darth Vader is too close to Darth Vader?